This is a great little recipe for a tasty meal you can throw into the cooler for one of those summer day trips. Once again, it's a very old British recipe that has been brought up to date. If you search the Internet for "Savoury Pie" you will find a lot of recipes. I found many that used the word "savoury (or "savory") as an adjective. That means there are hundreds of pies that have savoury, rather than sweet ingredients. To be honest, I don't know. As I post this recipe to the blog my savoury pie is still cooling in the fridge. But I promise you this; I am going to eat it for my supper tonight with some potato salad. I'll add a comment to this post to let you know how good it is. It would really encourage me to carry on posting these recipes if you would add your comment (use the link at the bottom of this post) if you try this recipe. You can add your comment anonymously if you wish. Thanks. 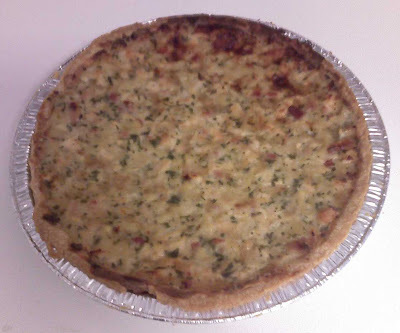 Ok I ate some of my pie for supper last night and it was indeed very savoury and tasty. For my personal preferences, a little more pepper and maybe a bit of garlic would really make this a great dish.